Enjoy a relaxing night in (your bath) with a box of "chocolates"! 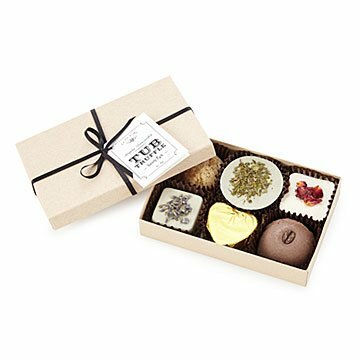 Made with cocoa butter, silky kaolin clay, and finished with aromatic essential oils, this set of tub truffles turns a simple bath into a luxurious spa experience. Simply crumble one of the beautifully presented rose, grapefruit, lavender, rosemary, citrus, or mocha truffles under the running water to release a deliciously smooth and fragrant soak that's perfect for after a long work day, or a lazy afternoon to yourself. Handmade in Encinitas, California. Useage Instructions: Crumble tub truffle under running water in your bath tub for a rich and luxurious bath soak. My husband and I bought this for his mom for Valentine's day - she lives in the Midwest where it's often too cold for comfort, and this seemed like a cute, simple gift to let her know we were thinking of her. She sent us a photo as soon as she received them, and they look as expected - super cute and perfect for a cold February day! Since I did not get them for myself, I'm not sure how they work versus expectations, but they look just lovely. My wife enjoys it after work to help her relax. My wife is pregnant and has a superhuman sense of smell for the time being. These not only helped her relax in the tub, but helped relieve her stress with the aroma therapy the product provided. Great product. I was really looking forward to receive the soaks. What a big dissapoitment when i opened the box. The scent is not nice at well. It only smells lavanda. The truffles are broken. I wanted to give it as a Christmas gift and will have to think about smth else. Definetely not looking as on the picture. It came in the really nice package, the presentation was awesome. This was perfect for my mother in law. This is so fragrant that you can smell it even unopened and it's such a cute idea. These arrived today and I was so excited until I opened the package (not the tiny box but the big one everything else came in.) Everything smelled awful! I had to get a refund on the socks I ordered because they came in the same package as the tub truffles and reeked of herbs and patchouli. The truffle box is adorable and the truffles themselves very pretty, so A+ for presentation. However, there is nothing in here reminiscent of lavender/rose/any other feminine scent for that matter. Everything was overpowered by a strong musk/herb/patchouli smell. Do not order these unless you are ordering them in isolation because they will make everything else in the box smell, too. Maybe these just aren't for me but they simply seem way too "hippie" for my liking and I did not want to give them as a gift. My mom loved these! Much better than the traditional box of chocolates. They are very fragrant, and come in a sturdy yet cute little box. Would definitely buy again!